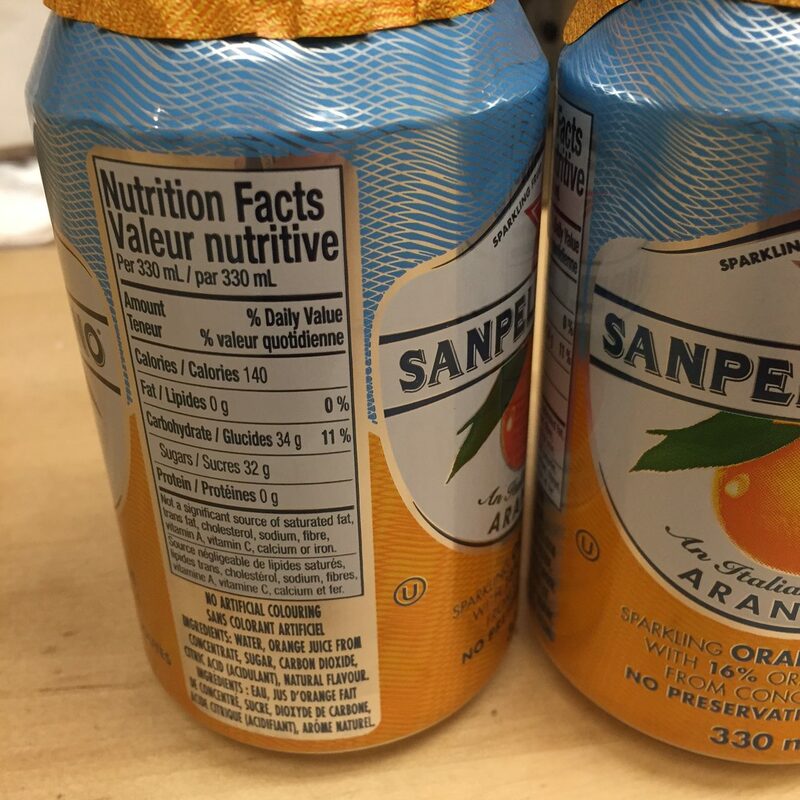 Sweet Spot Nutrition > What to Eat > Have you been hoodwinked by SanPellegrino? 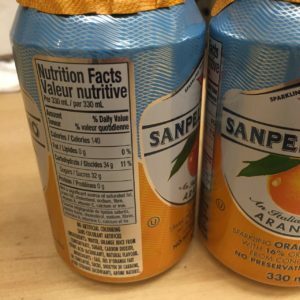 Have you been hoodwinked by SanPellegrino? Most people are quite aware that Coke, Pepsi, and other sodas are liquid sugar bombs. 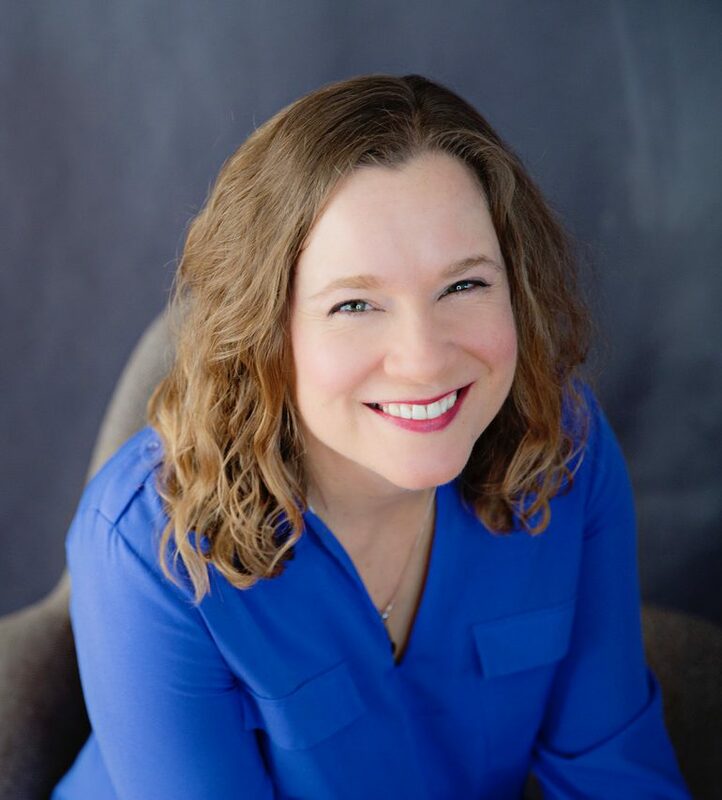 Since going into private practice, I’ve been invited to speak at numerous events about healthy eating, and I’m happy to report seeing less and less pop being offered to attendees (although it’s not gone… see picture below, taken just this month). For someone eating 2000 calories per day, 5-10% would work out to no more than 50g of sugar, and ideally we’d be closer to 25g. A teaspoon of sugar is about 4 grams, so the recommendation translates into no more than about 6-12 teaspoons of free sugar a day. 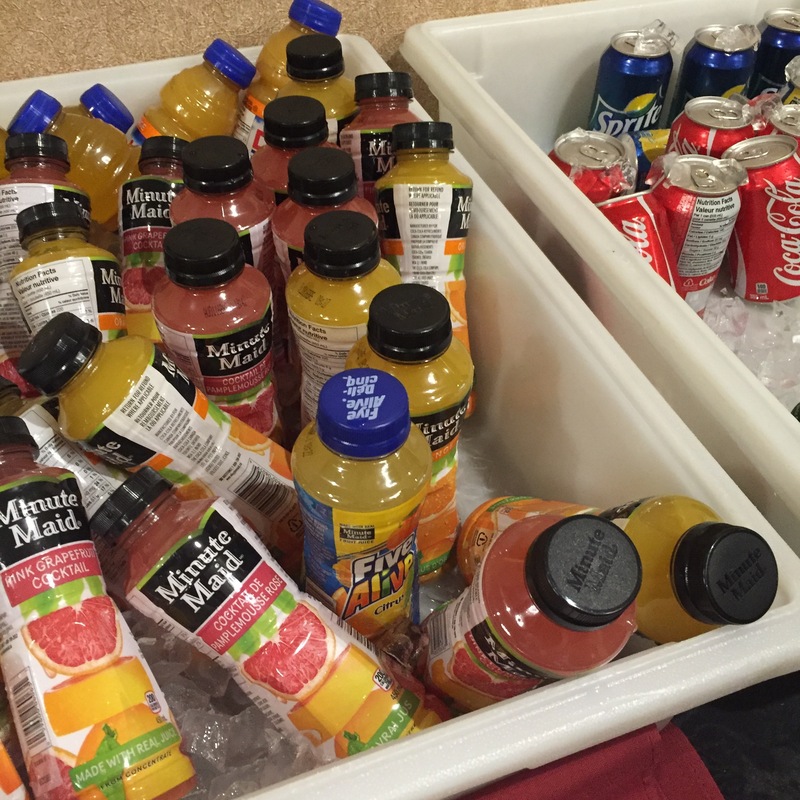 But aren’t the juices healthier than pop? Don’t they give you vitamins or something? Well, perhaps slightly. Along with about a day’s worth of free sugar, they might give you a few vitamins and minerals you could easily also get by eating fruit. So why not drink your fruit? Turns out liquids don’t fill you up the way solid food does. Drink it and you’re much more likely to overdo it. If weight management is a priority, you’re much better off eating your fruit, especially if you’re sitting all day at your desk or in a meeting. That bottle of Minute Maid orange juice (a Coca-Cola product, by the way), is equivalent to 3-4 navel oranges. When is the last time you ate 3-4 oranges at once? 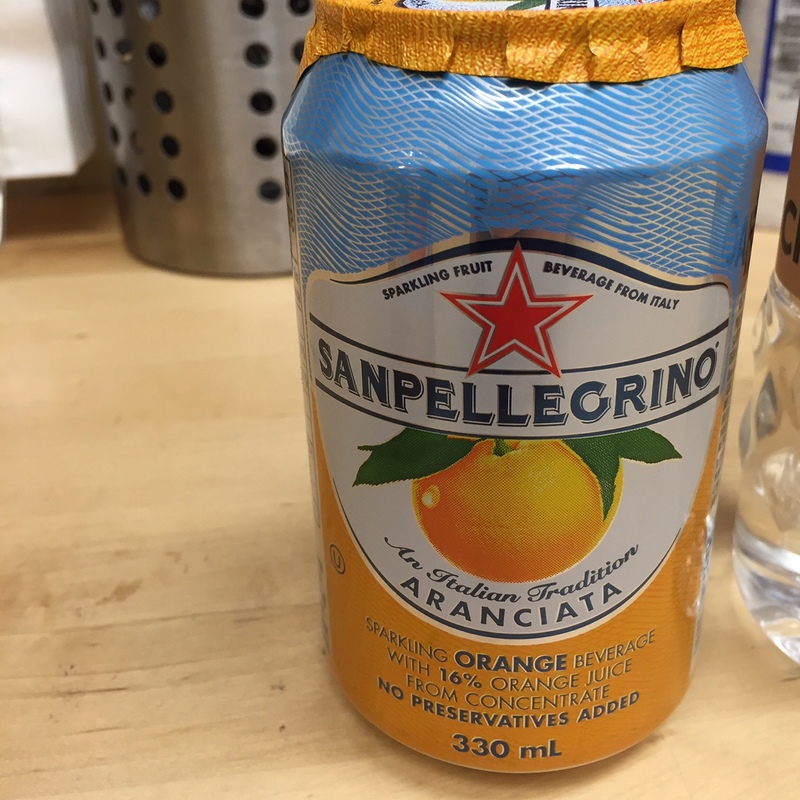 One extra note about SanPellegrino’s wholesome-sounding “sparkling fruit beverage” from Italy. 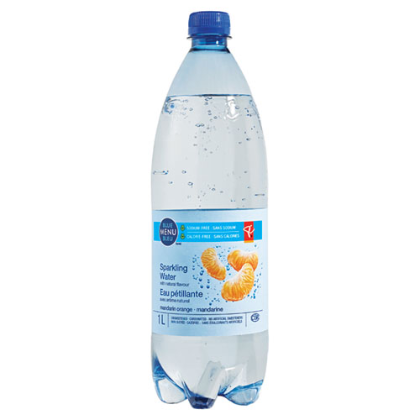 (“An Italian tradition,” and a Nestle product, Canadian readers might be interested to know.) 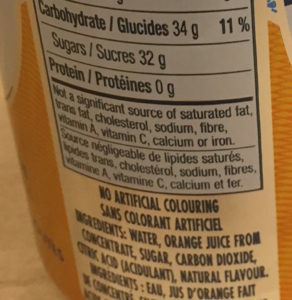 Read the ingredients closely, and you’ll see that it not only gets free sugar from orange juice, but there is also added sugar in the ingredients list. And it’s basically not a significant source of any nutrient. 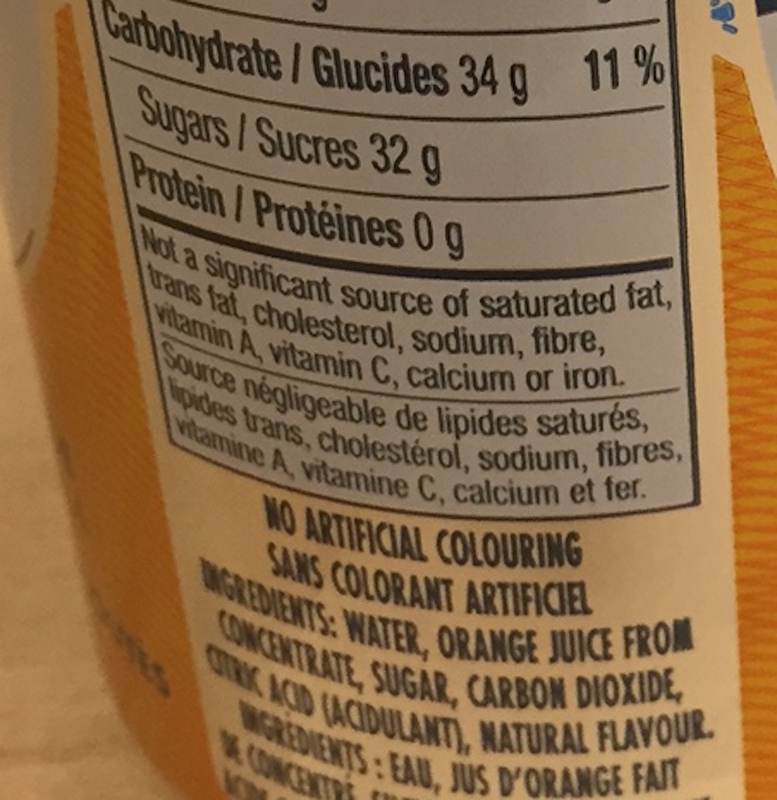 But hey, at least there is no artificial colouring. 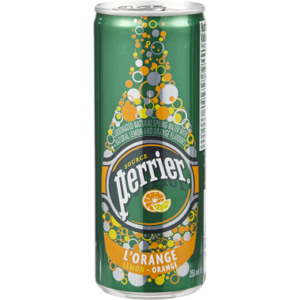 A better choice would be their plain Carbonated Natural Mineral Water. 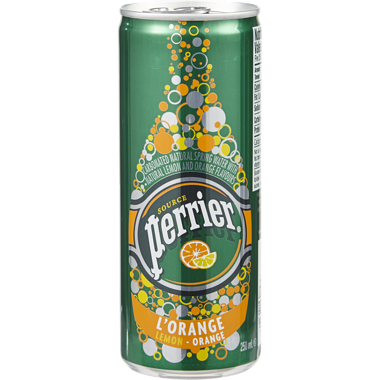 Orange flavour, but no sugar. Also no sugar. I think that’s what the nice folks buying SanPellegrino Sparkling Fruit Beverage think they’re getting. Food packaging can be awfully misleading. Read the label. Me, I’m saving my sugar budget for chocolate. Have you seen this at work or at a meeting? Did you pop one open, thinking it would be a healthy choice, based on the packaging? Always happy to hear your thoughts in the Facebook community.